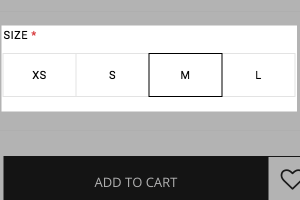 Remember Shopper Size will automatically remember a shopper’s last specified size and pre-select it the next time the shopper looks at the same or a similar product. Set the conditions to only show when your shoppers are on any of your site’s pages, including the Home page, product pages, and even in their shopping cart. Why Should I Use This Skill? Perfect for anyone selling apparel, the Remember Shopper Size is great to have so that your shoppers don’t have to constantly re-select their size. It’s like having your own, personal shopper! It gives your shoppers a feeling of inclusivity and personalization because their experience is tailored to their needs. Plus, it takes out one extra step for them, which means it’s quicker for them to complete their check out! How Can I Add This to my Store? 1. From within the fera.ai app, navigate to the Skills page, and click the button in the top right hand corner of your screen. 2. From the list of amazing skills that fera.ai offers, locate the “Remember Shopper Size” skill, and click the Choose Skill button. 3. When this has been selected, the Skills’ progress box will appear. Choose your Trigger & Conditions for how you want this Skill to appear using the drop down menu, as well as the and buttons. Note: You can add as many Conditions as you need. Remember all your Skills can updated and/or modified at any point, so if you aren’t quite sure yet how you want this Skill to appear, you aren’t stuck with your choices! 4. This Skill can be customized as much or as little as you wish, using the different tabs along the left side of the screen. 5. View your updates to the Skill and preview how everything will appear on your page by clicking the button at the bottom of your screen. Note: You will need to Preview before you can continue to your next steps. 6. Once you are happy with all your settings, click the button to Launch your skill! Note: you can also choose to Launch Later. Want more from this skill? Let us know what you’re thinking!